We are traditional carpenters and joiners with a keen eye for detail. We make anything with woods from around the world. We specialise in bespoke furniture, fitted and free standing. From small bookcases to full hand built kitchens. Everything we do is bespoke or a one off. We are used to supplying the domestic and Comercial sector with designer bespoke furniture. We love nothing more than a peculiar or different job. We have a vast array of materials and specialist we can call on to accommodate the most specialist of design briefs. At D J W we enjoy the challenge that comes with working with designers or you can use our in house design specialist. Please look through our photos of previous work to see if you can find some inspiration.We work closely with our customers from ideas to design to build and installation. We look forward to meeting with you to discuss any future plans no matter how big or small. We operate from a workshop in the heart of the Warwickshire countryside and would be happy to show you around our facilities and some of the projects we will be working on. Please call today for a free no obligation design meeting. 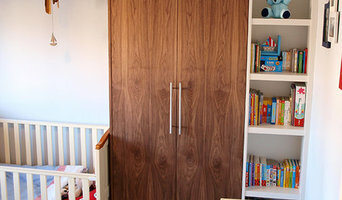 With 20 years of experience, Simply Storage offers bespoke storage solutions to maximise any dead space in the home. 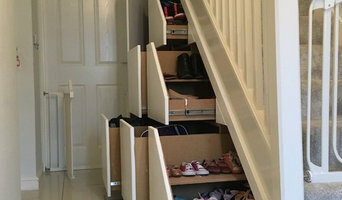 Specialises in under stair storage solutions. With over 20 years’ experience as bespoke joinery specialists, Nicholson have worked across a wide array of sectors including private, domestic, residential, office, commercial and industrial. We pride ourselves on delivering top quality joinery to customers throughout Warwickshire and the West Midlands. We offer a specialist joinery and carpentry service including the design, creation, assembly and installation of all manner of bespoke carpentry, from timber doors and windows to timber stairs, roof lanterns and conservatories. All of our expertly crafted structures add a touch of traditional warmth to your home. Our highly skilled team will work with you to produce the outstanding finished article you had envisioned at the start. Or we can provide solutions and recommendations to suit the desired budget, timescale or ambitious nature of your project. We believe that our work is among the best you can find in the West Midlands. So, if you’re looking for dependable and masterful carpenters in the vicinity of Birmingham, Leamington Spa, Nuneaton, Warwickshire, Stratford-upon-Avon or Rugby, then Nicholson joinery should be your first and only port of call. From fitted kitchens, conversions, extensions, oak framed buildings and conservatories to outbuildings and gates – Nicholson’s specialist joinery craft speaks for itself. We specialise in bespoke handmade fitted furniture and all aspects of carpentry and joinery services. With 17 years' experience in the trade we pride ourselves in having master craftsmanship and great attention to detail. We work both to architect's or Interior designer's specifications or directly with homeowners to discuss and create a unique piece and bring your design to life. We're passionate about quality and making the most of the available space. We are based in Warwickshire just outside Solihull. We offer a customer focused service with the emphasis on quality and craftmanship. We specialise in all types of carpentry and joinery and as a member of the Guild of Master Craftsmen, are dedicated to the values of integrity and high standards. Most things we fit are made by us and in the case of railings and glass by trusted professional associates. Please contact us with any queries and we will be happy to talk through ideas, we enjoy it! We specialise in making bespoke fitted furniture and stand alone pieces. Quality bespoke wooden planters and commercial planters. Each product is delivered fully lined and fully assembled with free UK delivery. We are a reliable and effective company with over 25 years’ experience in the private and commercial sector. We pride ourselves on excellent customer service and providing a professional quality carpentry, joinery and building service. We are able to offer a full range of services from small carpentry work to large commercial building work all professionally carried out to the highest standard. We use a trusted team of bricklayers, plasterers, electricians, plumbers, tilers and decorators that all have a wealth of experience and are skilled and reliable tradesman. We can also offer skilled bespoke cabinet making to suit your every need, and can provide ideas to enhance your own design. We will ensure that the disturbance to your household is kept to a minimum and will endeavour to work around your family life. Clifford Harris Ltd can also help advise you with your initial plans and work closely with your architect should you wish. Having successfully completed many projects, we gain the majority of our business through client recommendations. To add a quality feel to your project please call us for a quotation and we will be happy to come round and give you a free estimate at your convenience. We are a small family run bespoke cabinet making business based in Stourbridge, West Midlands. We consist of a small team of skilled cabinet makers with years of experience and a small administration office; we have no sales team therefore you will only ever reach one of the business owners or the Administration Manager giving a more personalised service which we believe makes all the difference. 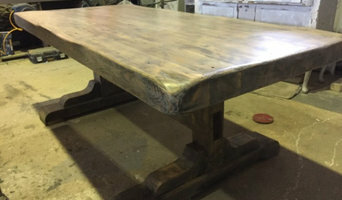 All of our furniture is designed and handmade for at our factory in Stourbridge, we keep our customers up to date with all elements of their order from the first enquiry to the fitting/delivery of the finished product. We pride ourselves on having good relationships with our customers hence the fact that we have many customers coming back to us and/or recommending friends and family members. We have a small showroom in Stourbridge, attached to our factory that showcases some of our work, you are more than welcome to come along and take a look. In short we offer: A personal, professional service. Completely bespoke, unique furniture; designed, constructed and fitted specifically for you. A free design and quotation service. Excellent quality and value for money that is far superior than anything you will find on the High Street. Durability, we only ever use high quality and solid materials that are built to last. I design and build all my own projects, I collaborate and brainstorm with my clients to get a feel for what they're in to, taste, colour, traditional or modern etc. I then start designing, I enjoy free styling on site once I've established a mutual trust with my clients. Mixing art and building skills means the sky's the limit with what can be achieved. Do you wish to install a wooden cabinet at home? Or need help installing new hardwood doors? No matter what your requirement is, we are here for you. With over two decades of experience, Designwood has been helping customers manage their refurbishment requirements. From all aspects of interior carpentry and flooring to exterior work and fencing, you can rely on us. We also cater to garage door installations, stair posts, spindles and installation of uPVC windows. With over 20 years' experience, we provide competitive prices for guaranteed work and have a free of charge, no obligation quote. We undertake domestic and commercial work and maintain and repair wooden products as well as provide bricklaying and plumbing services. Our range of services can help give your property a stunning finish. From plastering your walls to rewiring and other electrical works, we have you covered. Flashwood Carpentry & Decking are based in the West Midlands and are able to offer bespoke carpentry and decking services through out the Midlands. We are Exterpark and Richard Burbidge approved installers and are able to offer classic and contemporary decking and stair solutions. We work closely with clients and understand their needs fully and offer solutions to ensure projects come in on time and in budget. We are able to work on a supply and fit basis or install only. We offer free quotations at a time to suit and work can be undertaken at weekends at no extra cost. Deck designs are provided with quotations to enable customers to visualise what their final deck will look like. Should you wish to undertake the decking construction yourself, plans can be made available to purchase. We look forward to hearing from you soon and working with you in the future. Redditch Joinery has been manufacturing bespoke joinery since 1984, and is currently celebrating 30 years in the business. We have a well deserved reputation for producing quality work, using both traditional and modern techniques. The majority of our work is ‘one off’ bespoke design – and we have a wealth of experience which has enabled us to expand our customer base beyond the local area working for private individuals, architects, designers and building contractors. The majority of our work comes from recommendation and repaet business which is testament to the service we provide. ” We specialize in all things “made to measure” including windows, doors, fitted bedrooms, & gates, and we cover both the domestic and commercial sectors, but our skilled tradesmen can turn their hand to more or less any requirement. We only use the very best timber, sourced wherever possible from sustainable FSC accredited suppliers and all our timbers are specially selected for their high quality and fine grain. 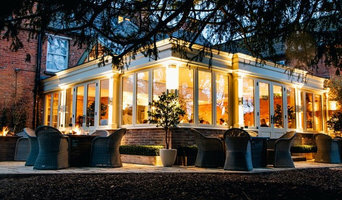 Our great team of woodworkers are equally skilled and experienced in making everything from timber doors and windows to the most elaborate timber conservatories, so whatever your joinery requirements, we are the one stop joinery experts. When deciding whether to employ a joiner or carpenter in Birmingham, West Midlands, it is best to pick your professional according to their experience on projects similar to your own. For example, installing bespoke joinery such as a staircase involves significant structural work and you might want to work with a carpenter in Birmingham, West Midlands with considerable experience in bespoke staircase joinery. You will often find you need to employ both a carpenter and joiner on a single project, and some firms will offer both skillsets which can simplify your overall hiring process. Where can I find a good Birmingham, West Midlands carpenter or joiner? On Houzz there are many professional Birmingham, West Midlands carpenters and joiners that specialise in providing a full carpentry service or bespoke joinery in Birmingham, West Midlands, whether dealing with fitted or freestanding, traditional or contemporary furniture. Simply search for a joiner or carpenter in Birmingham, West Midlands in the Find Pros category, then add images of designs that you like to an Ideabook and contact those on your shortlist. If you need reassurance beyond photos of their work and reviews of previous clients, then you might check to see if the carpenter or joiner is a member of The Institute of Carpenters (IOC), The Guild of Master Craftsmen, the British Woodworking Federation (BWF) or the Federation of Master Builders (FMB). Each asks its members to meet a certain level of expertise and abide by a code of conduct. 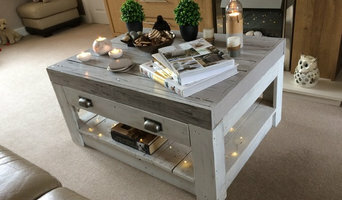 Have a face-to-face consultation – basic brief and image references in hand – see which joiner or carpenter in Birmingham, West Midlands is the easiest to get along with and who best understands what you’re trying to achieve. How long have you been a joiner or carpenter in Birmingham, West Midlands? Do you offer bespoke joinery in Birmingham, West Midlands as well as standard carpentry? Find a carpenter or joiner on Houzz. Narrow your search in the Professionals section of the website to Birmingham, West Midlands joiner and carpenter professionals. You can also look through photos of woodwork and bespoke joinery in Birmingham, West Midlands by style to find a design you like, then contact the joiner or carpenter in Birmingham, West Midlands that worked on it.